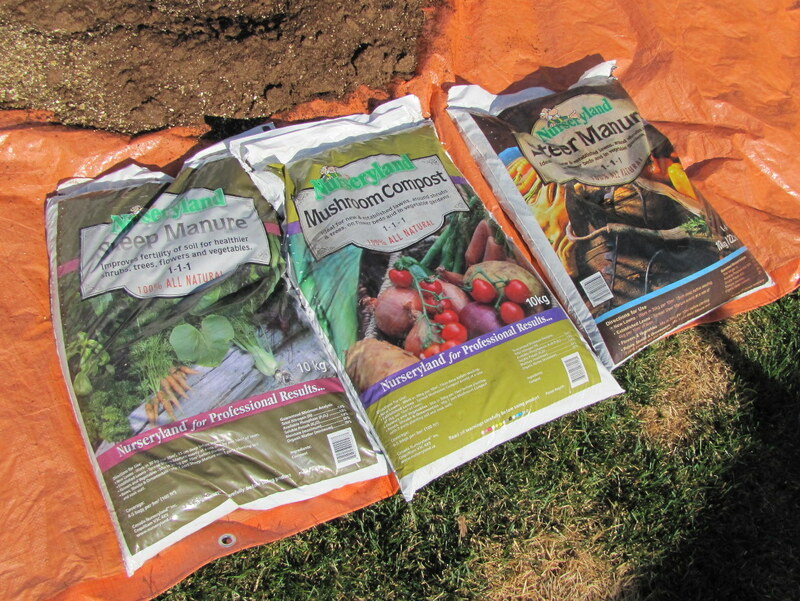 I like to use a mix of 1/3 peat moss, 1/3 vermiculite and 1/3 manure or compost. 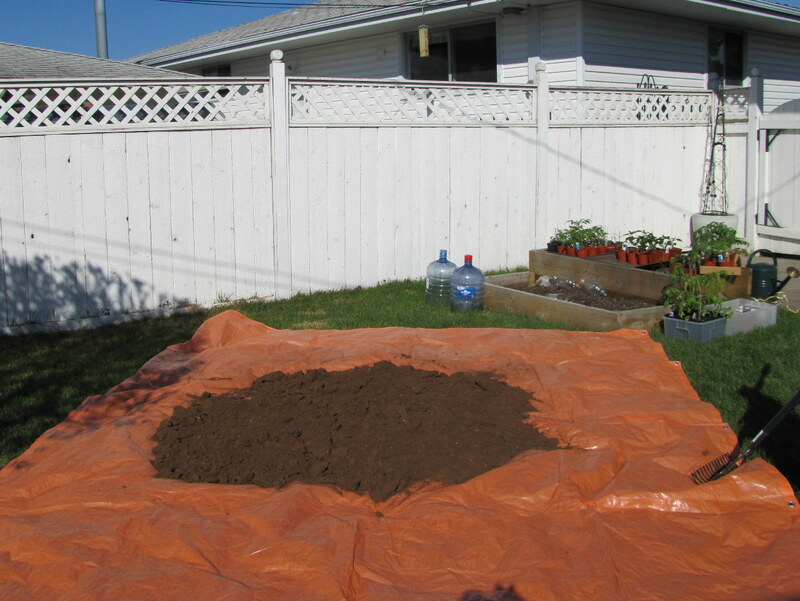 When I mix up a big batch of soil for the raised beds, I use a large block of peat (107 litres or 3.8 cubic feet), a large bag of #2 expanded vermiculite (118 litres or 4 cubic feet) and four bags of manure (4×10 kg or 22 lbs). 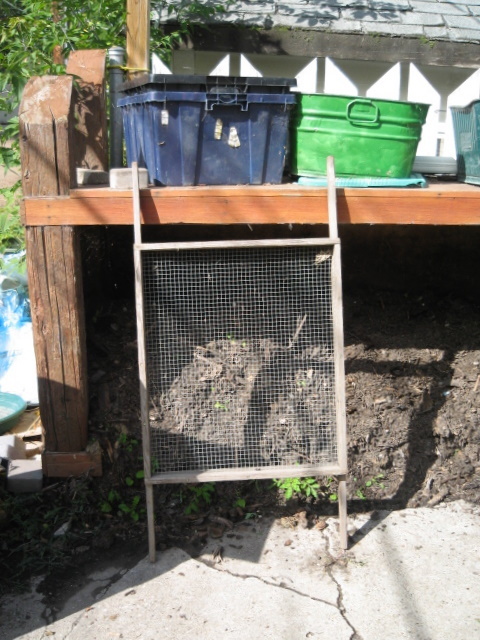 The manure or compost should be a mix of different types: steer, sheep, mushroom, worm castings, or whatever you can get your hands on. The more variety the better. 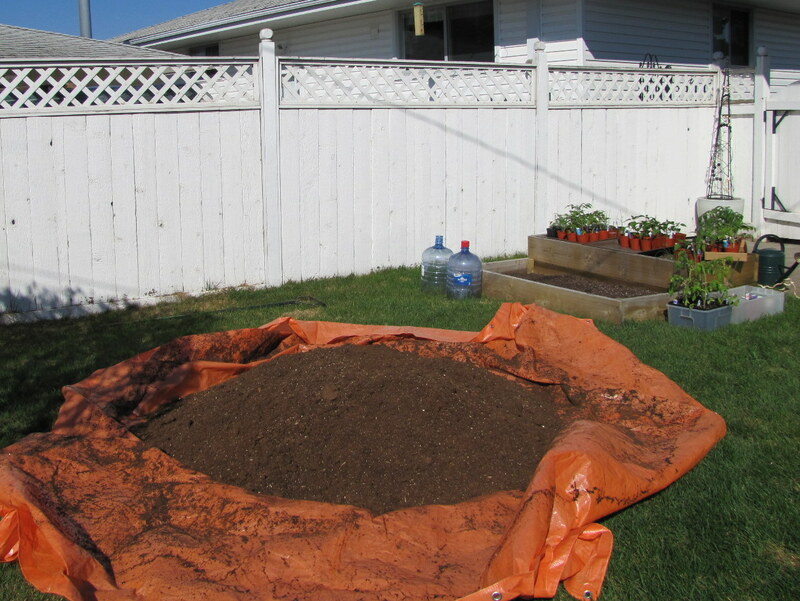 I use a large tarp spread across my lawn and a rake to mix with. 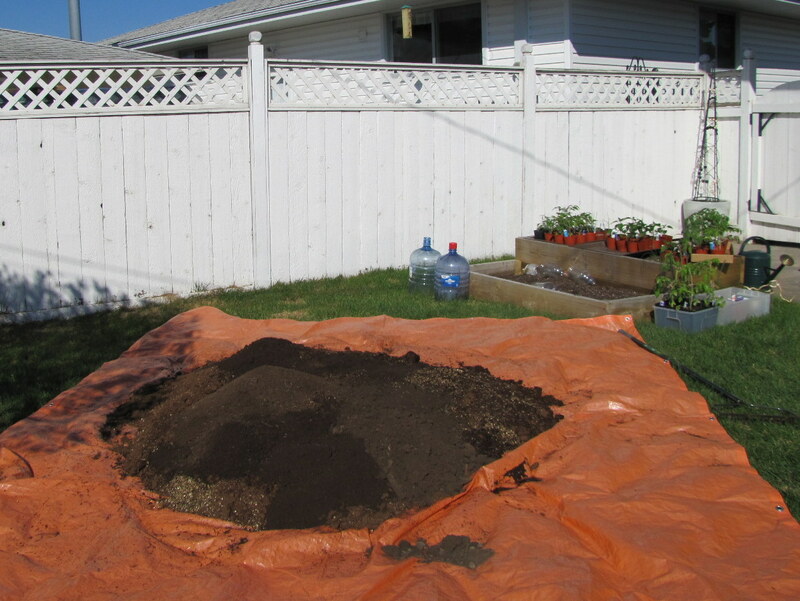 Start with the peat moss, spreading it out and getting rid of all the clumps. If you value your ability to breathe then be sure to keep the peat moss moist while working with it. Next, add the vermiculite again making sure to keep the dust to a minimum. Mix them together and add the manure. 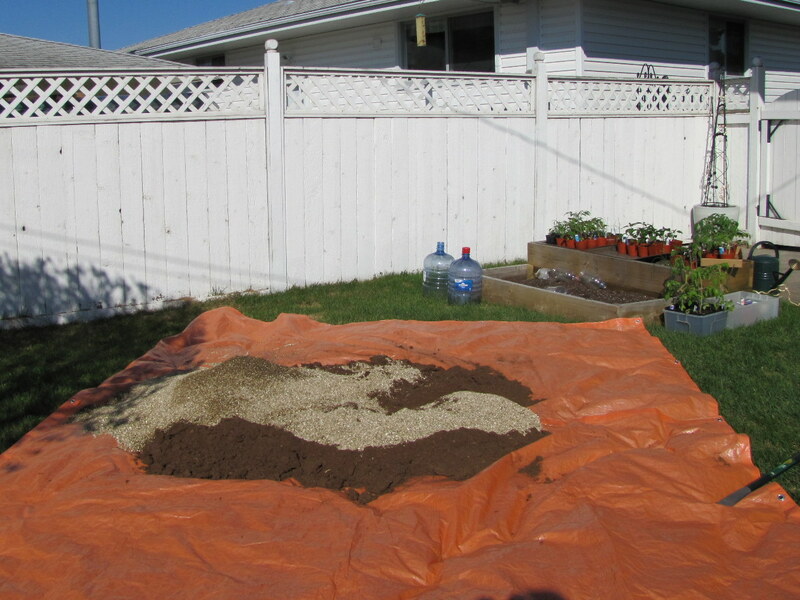 The pile is getting fairly large at this point and to get a thorough blend you will need to lift the tarp from side to side to mix the ingredients. Once the soil has been well mixed it’s ready to use. 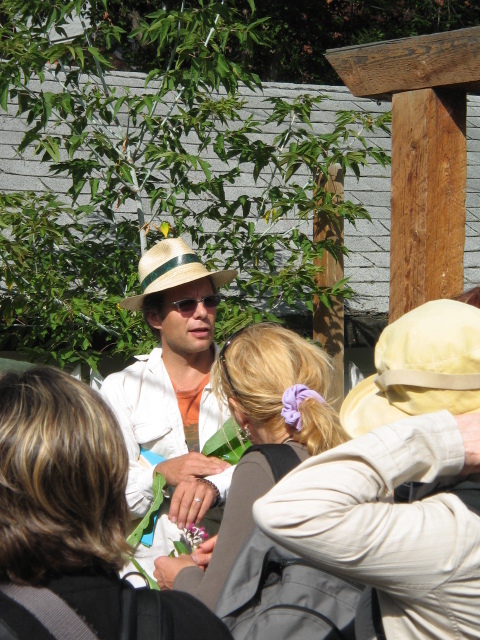 This year’s Edible Garden Tour, hosted by Ron Berezan AKA The Urban Farmer, was held on August 14th. Meeting at Giovanni Caboto Park on a cloudy Saturday morning, fifty enthusiastic gardeners split into two groups and proceeded to visit ten amazing gardens distributed about the Edmonton area. Some of those taking part in the tour already had enviable gardens of their own, while others were planning for the day when they might. 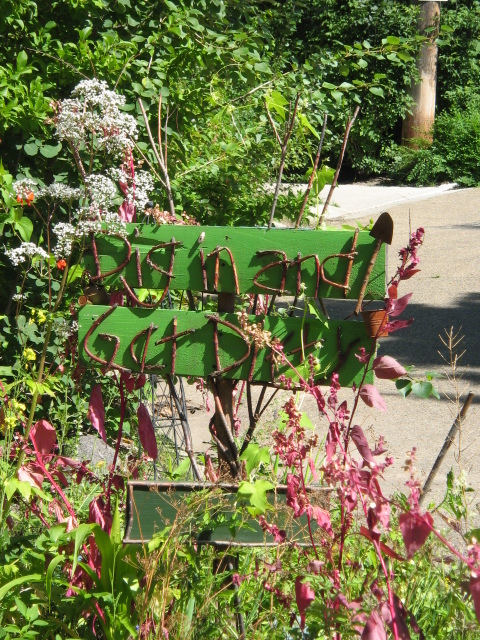 The tour featured everything from backyard orchards to front yard vegetable gardens, and was brimming with inspiring ideas for both experienced and novice gardeners. 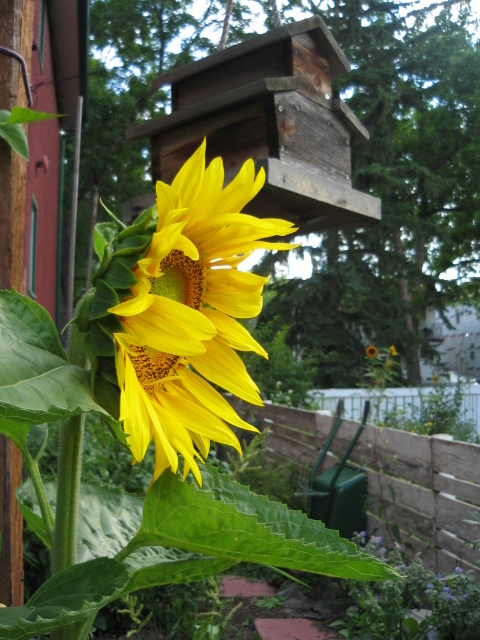 Each home on the circuit incorporated aspects of permaculture gardening; landscapes that work with nature to provide food, medicinal plants, and animal products and in a sustainable way. Permaculturists create a sustainable, productive environment through recycling, composting, reducing water needs and using microclimates to their advantage. 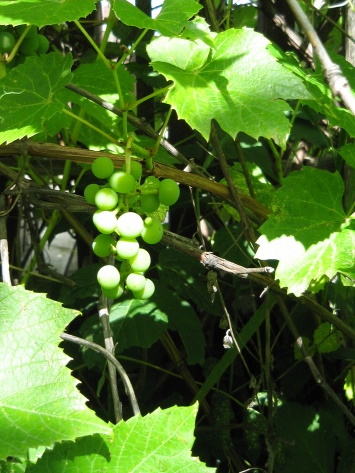 The forest garden is one example permaculture in action. Berezan’s own backyard is a testament to multi-layer design with stacking of canopy trees over shrubs and herbaceous plants followed by root and cover crops. Each layer in this polyculture interacts, creating a complex yet fundamental ecosystem. 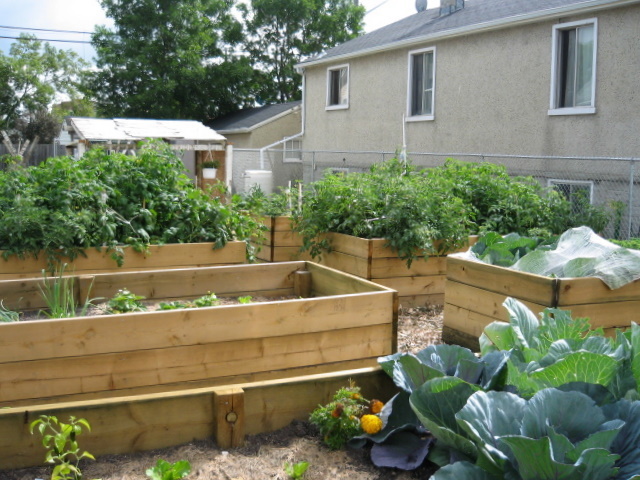 A visit to the Mustard Seed Community Garden, aptly named “Peas Be With You”, demonstrated what can be done when a small plot of land is transformed into a neighbourhood garden space. 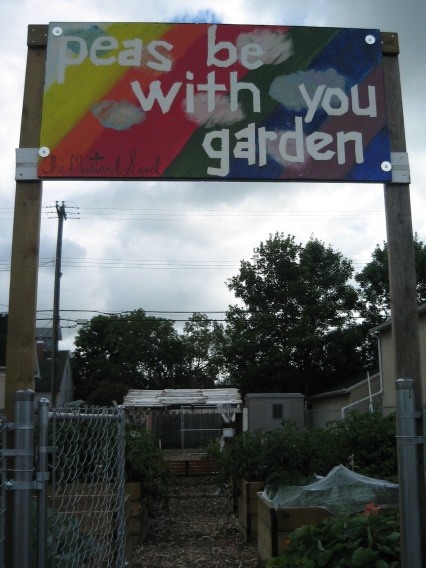 Shared by both local residents and the homeless, the Mustard Seed garden produces food that is prepared and eaten by the green thumbs that participate. We saw some amazing private gardens throughout the city as well. 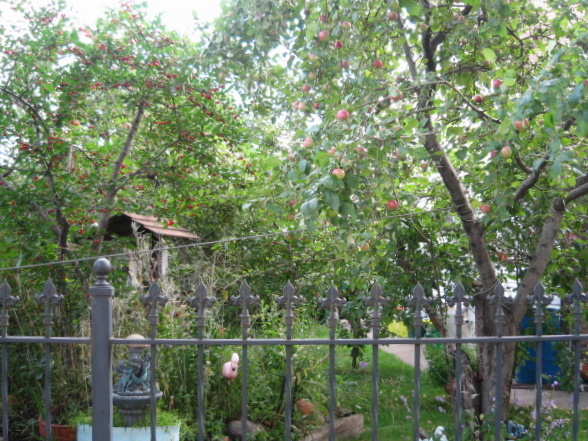 The fruit of years of grafting and nurturing were apparent in one homeowner’s apple orchard which featured trees drooping under the weight of as many as four different species of apple. 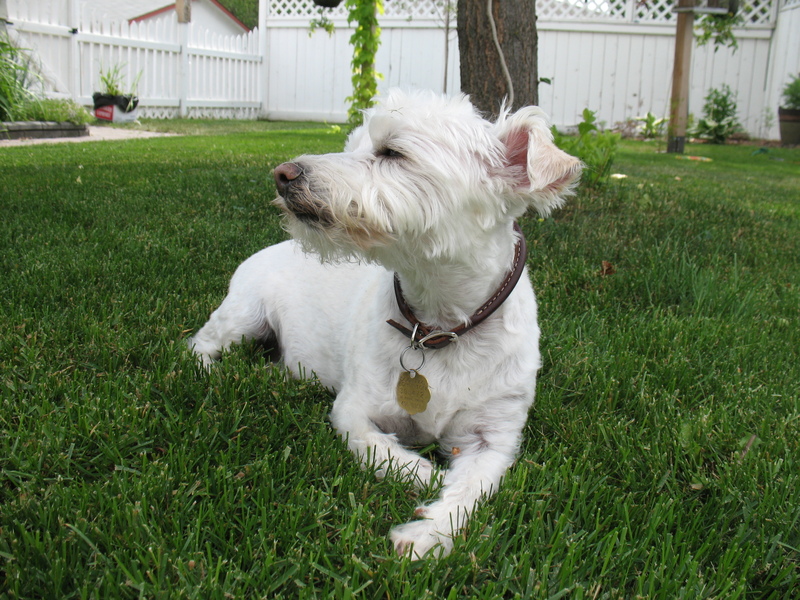 A Glenora area homeowner encourages people to slow down and smell the roses – literally. She has incorporated rest stops in her front garden and a nearby public access area with signs which invite people to stop and explore. 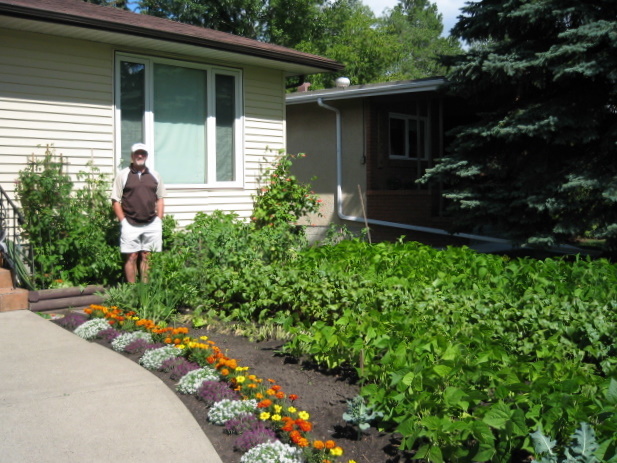 We met Roy Berkenbosch, winner of this year’s Front Gardens in Bloom (Edible Garden Category). 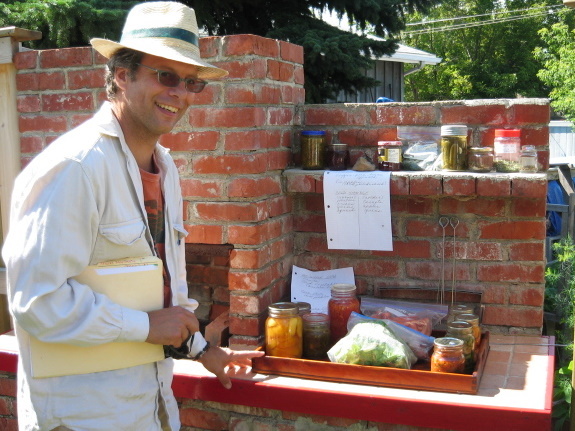 Roy and his wife have transformed their front yard into an edible landscape full of beans, beets, and other culinary treats, while maintaining an attractive aesthetic. 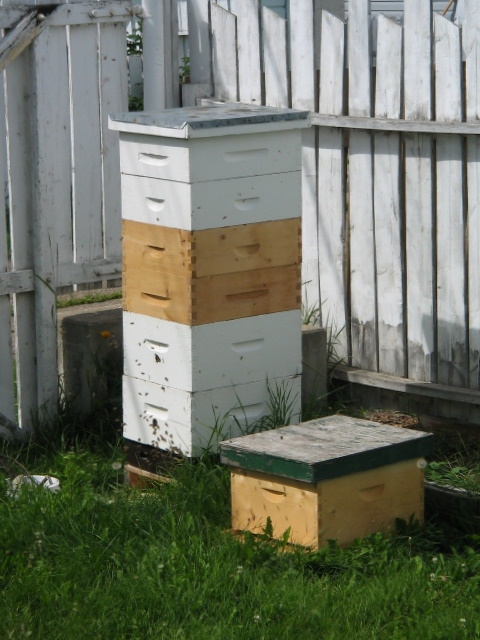 I personally enjoyed our visit to a backyard apiary, although I have to admit I was worried that the bees might be able to smell my discomfort. As many as 50,000 bees inhabit this backyard beehive and it has already produced over 40 lbs of honey for the amateur beekeepers. 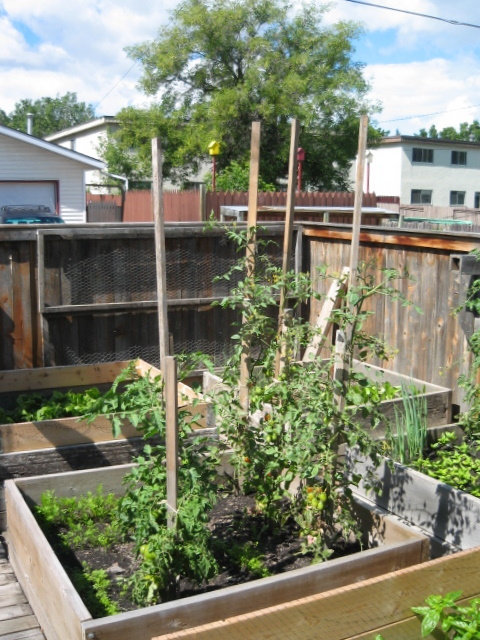 The 2010 Edible Garden Tour was an amazing private view into the yards of ordinary Edmontonians with extraordinary vision. I’m always inspired by touring other gardens, and this year was no exception. 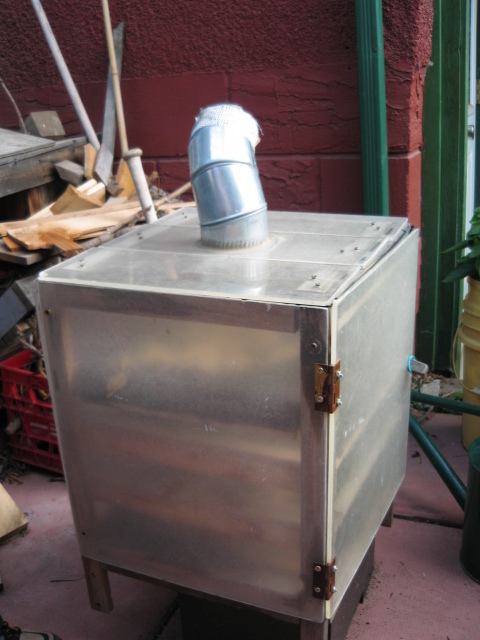 I’m already working on plans to build a solar food dryer, rebuild my square foot raised beds to be more efficient, and I’ve dug my mom’s old canner out of storage so that I can experiment with canning more varieties of vegetables this fall. Thanks to the Urban Farmer for hosting the tour. Here’s hoping that after Ron departs for warmer B.C. climes the tours continue. 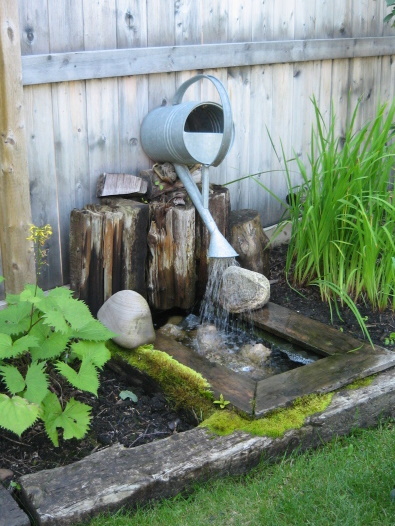 Permaculture is increasingly popular among those of us who enjoy the feel of dirt under our nails, and we can all use a little inspiration now and again. If you’ve been following my blog for the past few months I’m sure you know how much I love to save a dime by making things myself rather than buying them. 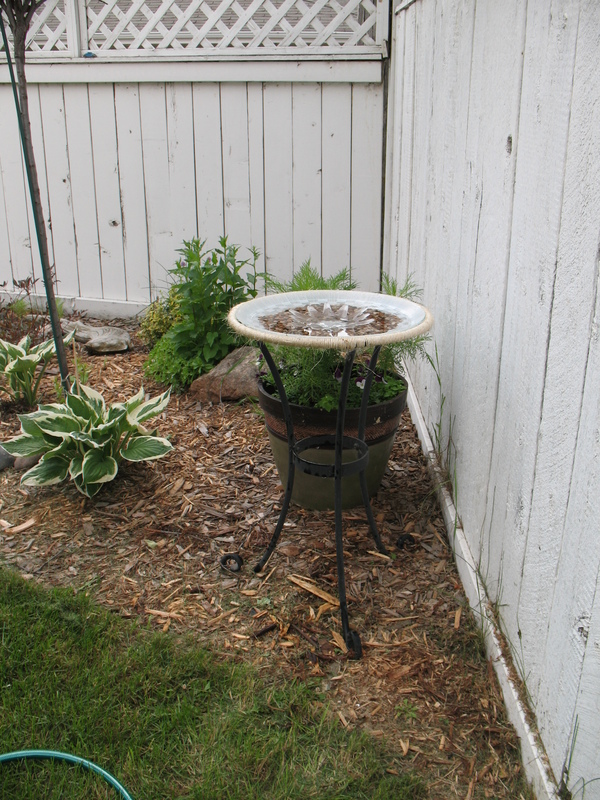 This is the story of my $1.25 bird bath. 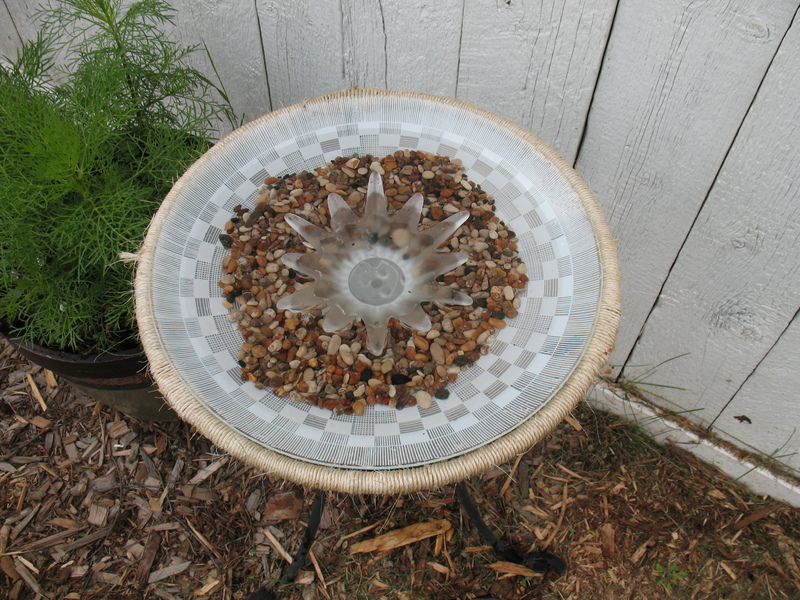 I had a bird bath bowl that I didn’t much like. 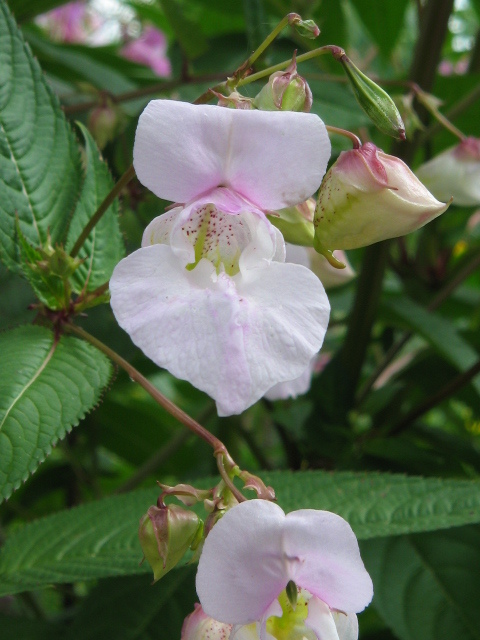 It was shaped like a flower and had petals that seemed to collect a red mold or fungus that tainted the water. All the bleaching and cleaning I did didn’t seem to help rid it of this invader, so I finally threw it out. 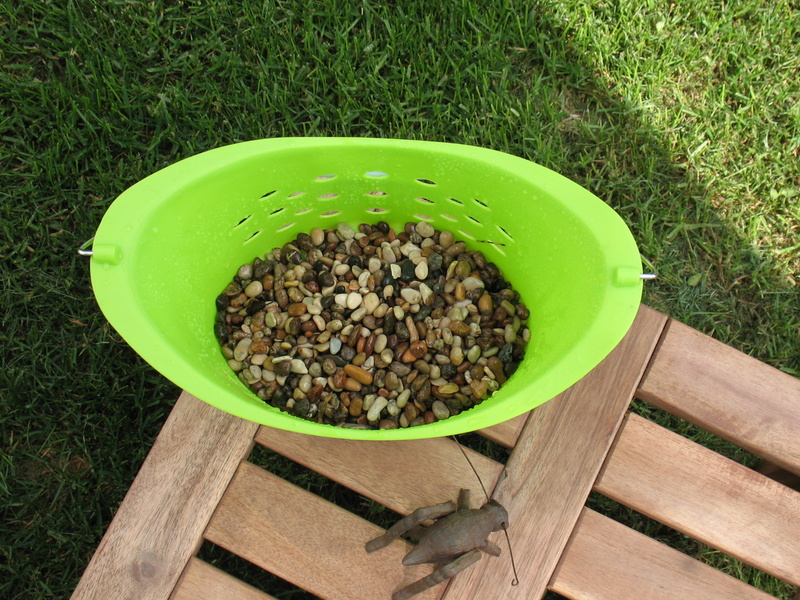 I needed a replacement bowl, but found it difficult to find something that would fit my 15 inch wide bird bath stand and was shallow enough to be a reasonable bath. I found my solution at a thrift shop. 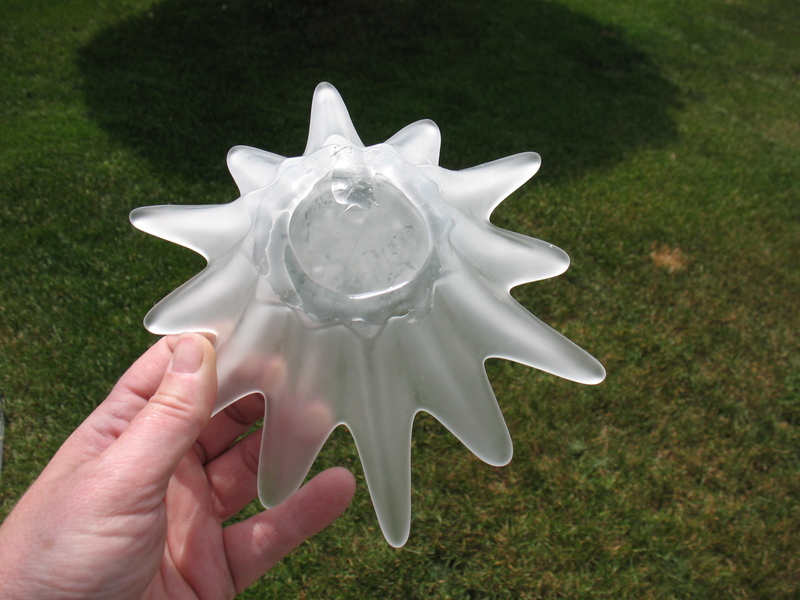 I bought the shade from a ceiling lamp fixture for $1.00 and a glass tealight holder for 25 cents. The light shade was just over 15 inches, so it fit the bath stand perfectly. The tealight holder had long protrusions which I thought would make ideal perches. I glued the two together using a product called Plumbing Goop, which not only sealed the two but is waterproof and winterproof. 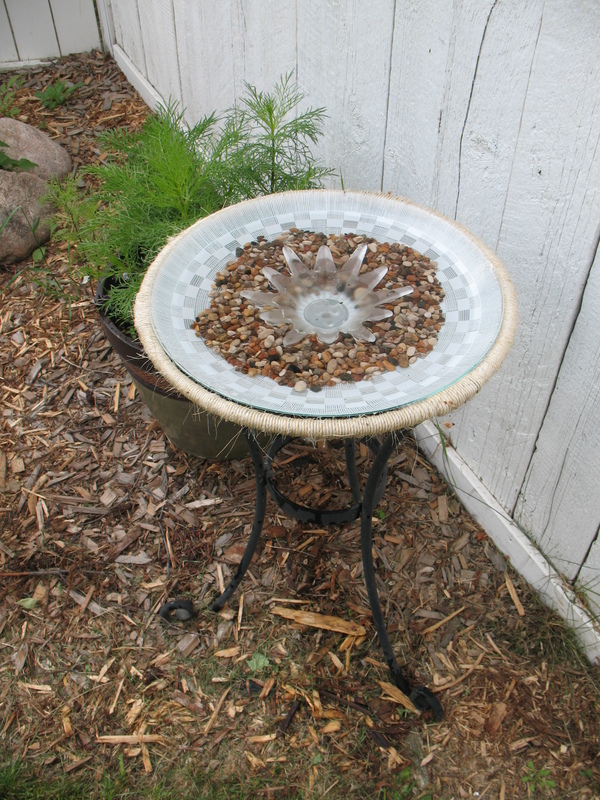 I had collected some carefully screened pebbles from a beach in Manitoba, and I used these to line the bottom of the bird bath in order to give the birds a spot to stand if they chose to take a dip. Overall, I think it turned out kind of cute, and at $1.25 I certainly didn’t break the bank. 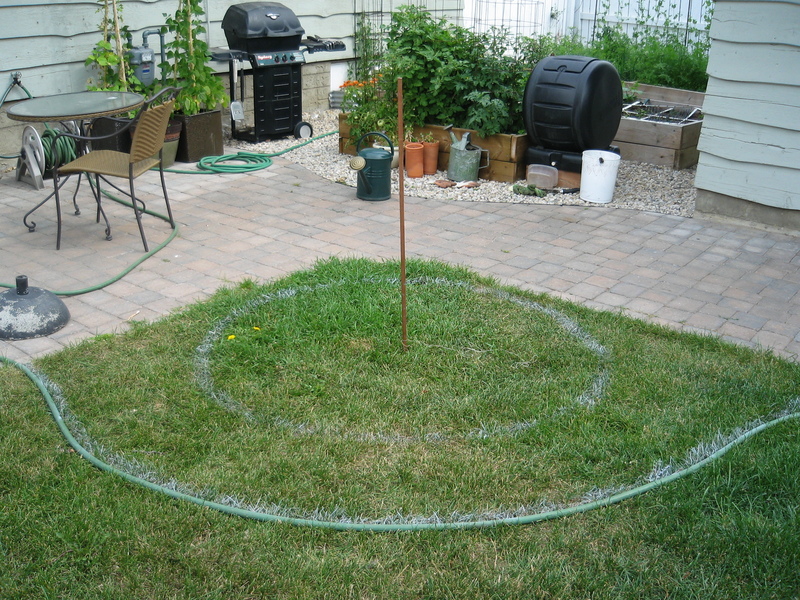 An herb spiral is a raised circular bed designed to provide herbs with a variety of growing conditions. They’ve been around since the middle ages and are once again in vogue among gardeners, especially those who practice permaculture. 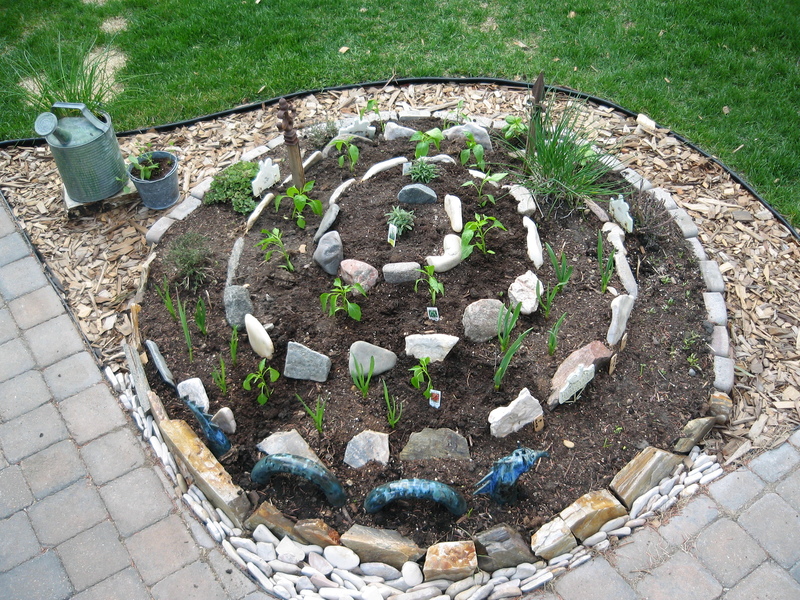 Herbs that prefer drier conditions are placed near the top of the spiral and those that prefer more moisture are placed near the bottom. 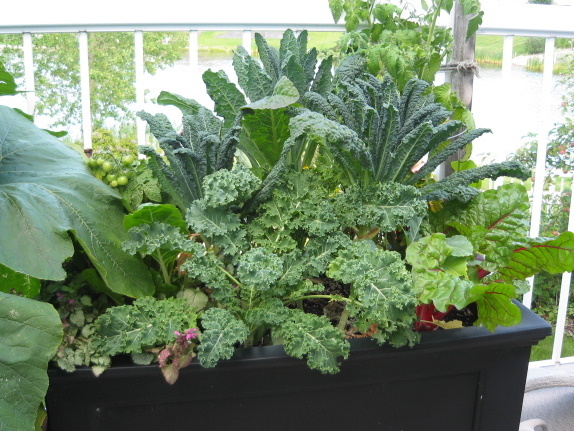 Micro-climates allow for some plants to have access to more heat and others less. Shadier spots near the north side favor herbs that prefer less direct sun. 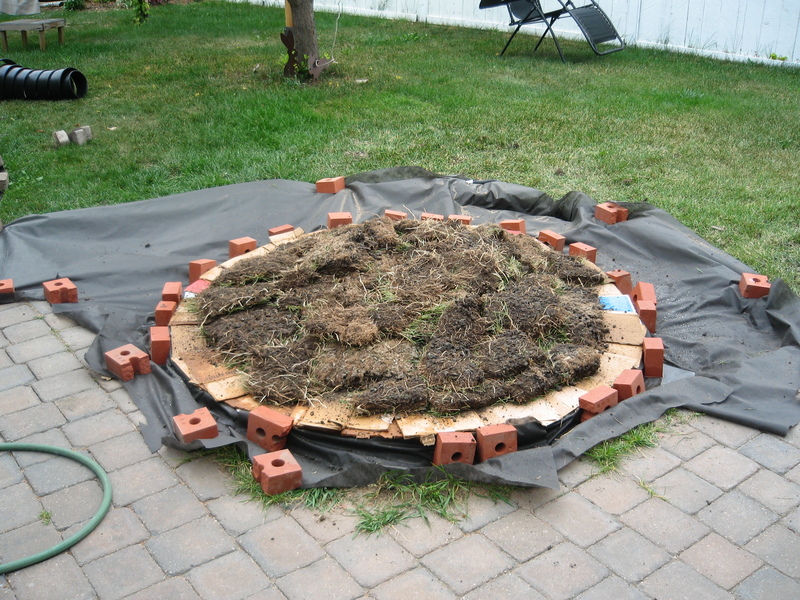 I began building my own herb spiral last fall. Early this spring I transferred my sage, oregano, thyme and chives from other locations in the yard and planted some garlic. I seeded cilantro and parsley and they are well on their way. I was given some spearmint but left it in a pot alongside, as it can become very invasive if planted directly in the soil. 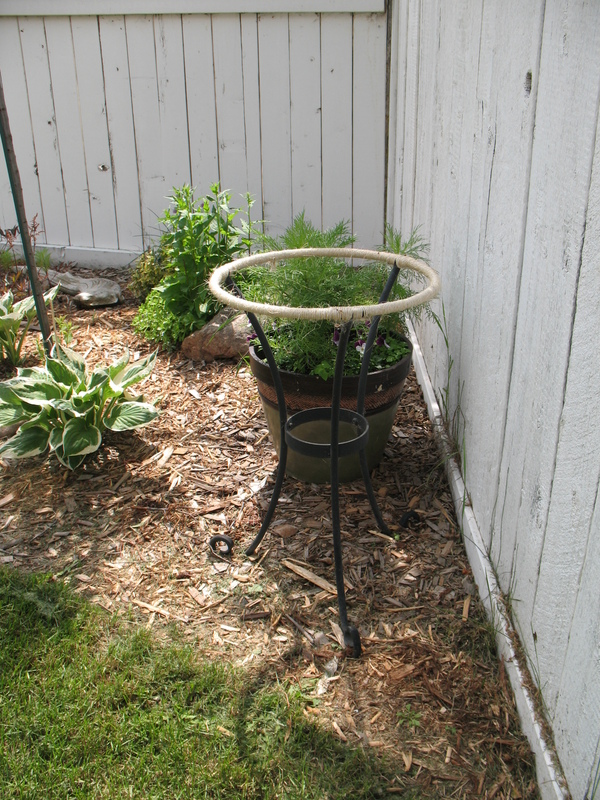 In the fall I’ll bury the pot to the rim and that should allow the spearmint to over-winter. I bought basil and rosemary from the garden centre and planted them this week. I’ll use an empty juice bottle to cover them overnight for the first few weeks until all risk of frost is over. 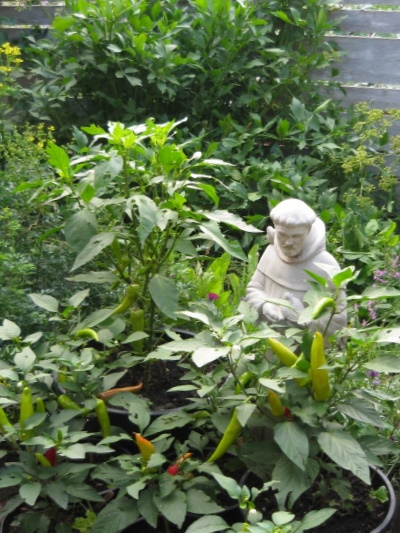 I also added a dozen pepper plants – red hot cherry and jalapeno. This was a fun project. 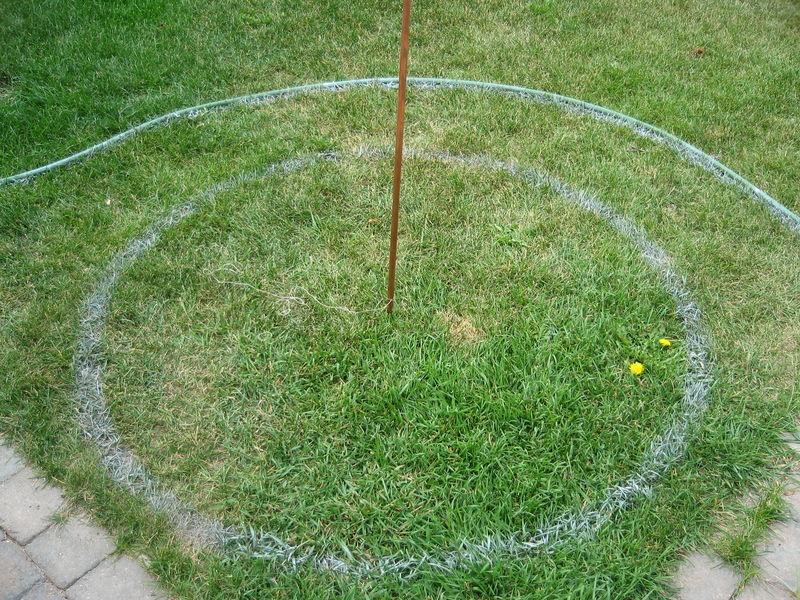 I picked a location close to my back door and began by laying out a pattern using a garden hose. 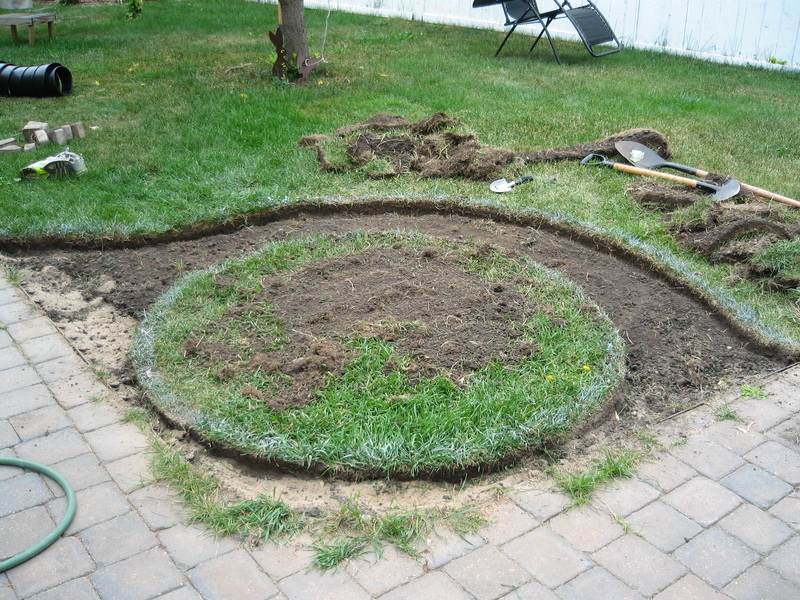 I dug up the grass around the herb spiral and saved the sod. 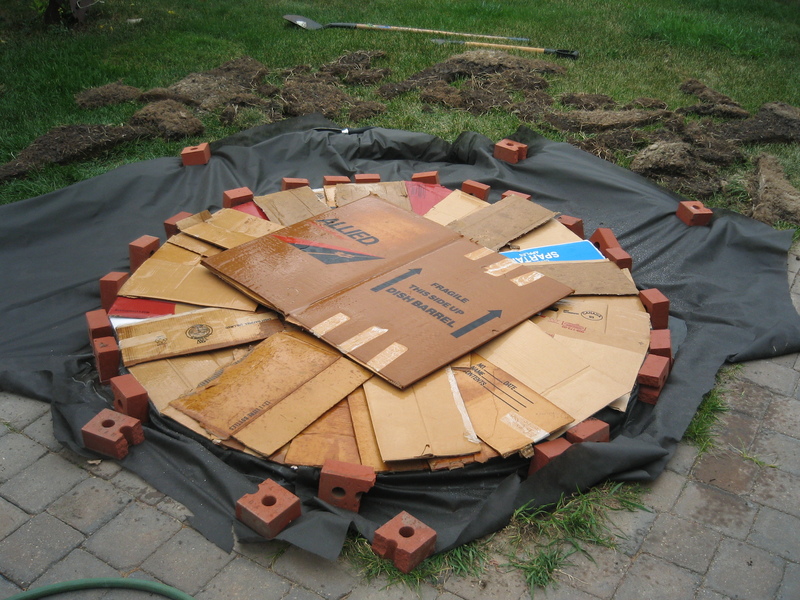 On the circular area where I planned to put the spiral, I placed cardboard over the grass to kill it, then placed the clumps of sod upside down on the cardboard to build volume. 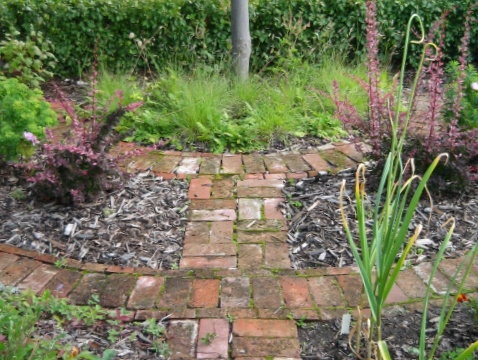 I placed landscape fabric over the area surrounding the circle and defined the spiral with pavers and bricks. 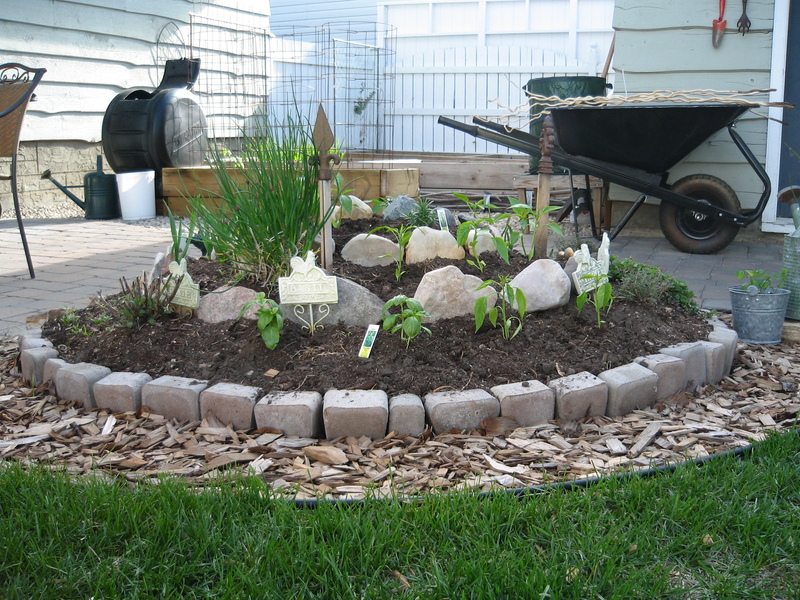 I filled in the surrounding zone with cedar chips and small flat white stones. 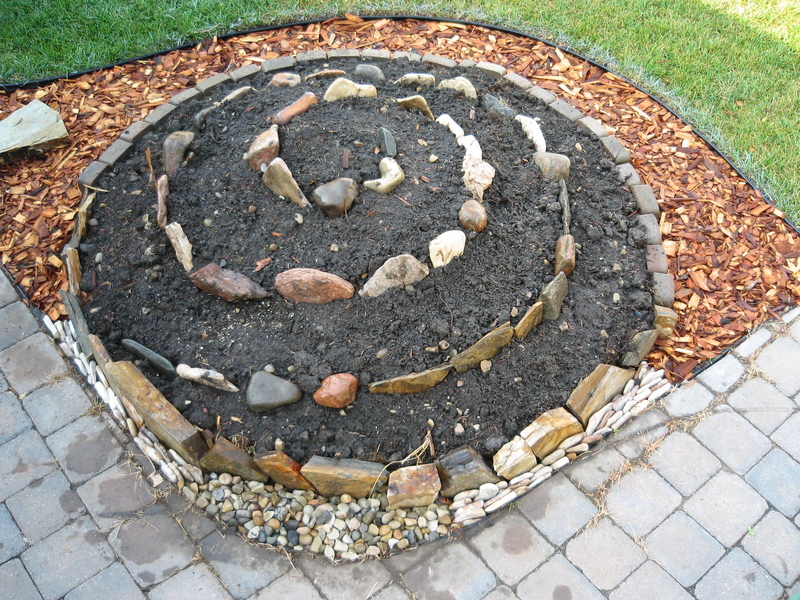 I added soil and created a spiral pattern with stones, and left it for the winter. 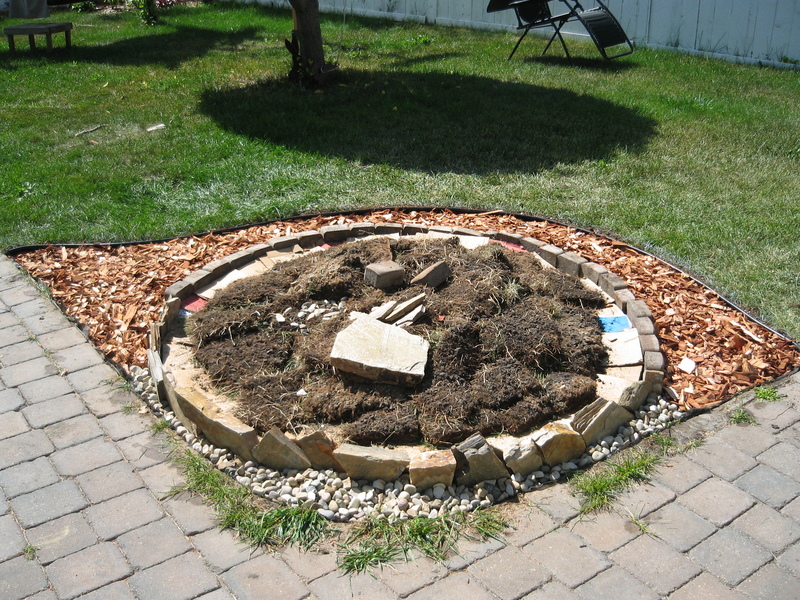 In the spring I added more soil and raised the spiral an additional foot to create a greater difference in height. I then transferred my plants and seeded some of the others. 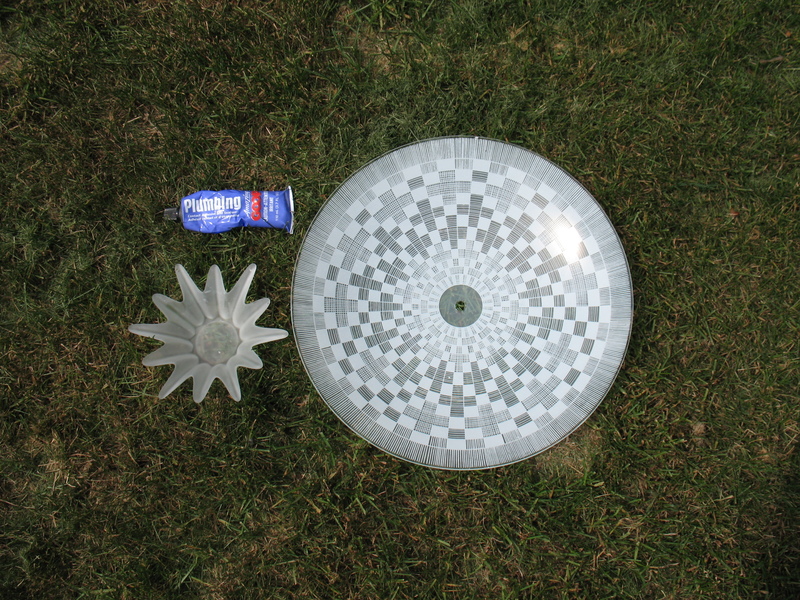 I bought a few bedding plants to fill out the spiral and in the end I was very happy with the outcome. OK, technically a clothespin bag has nothing to do with gardening. 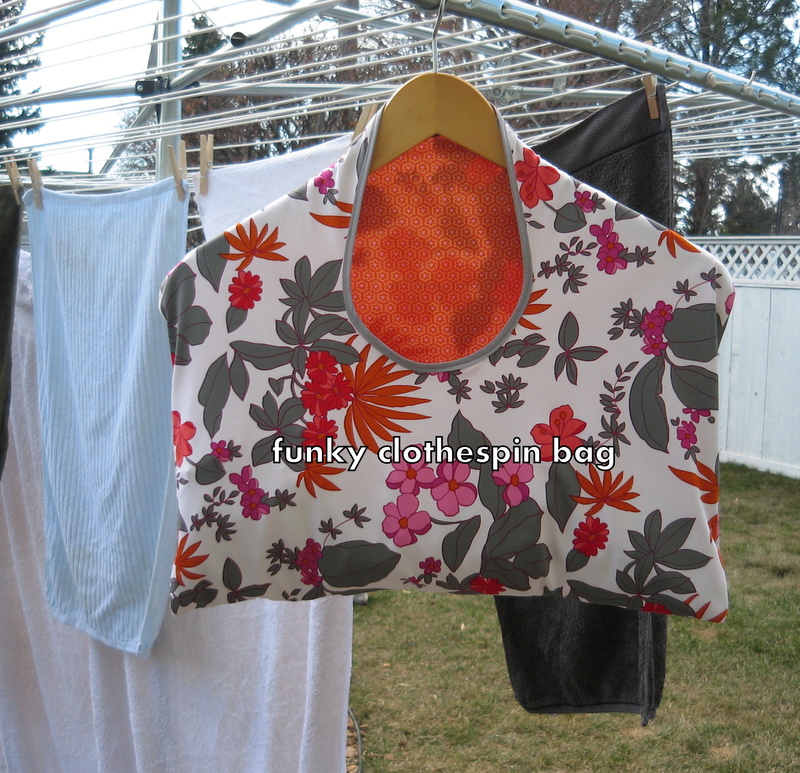 Still, I can’t resist sharing a good idea and I think that having a funky clothespin bag is a great idea. 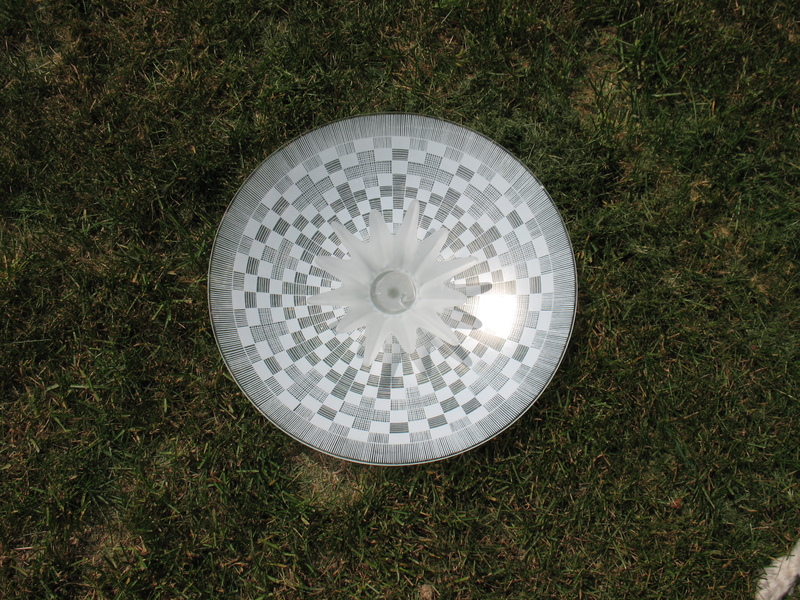 Gardening involves using sunshine. Drying clothes on the line involves using sunshine. 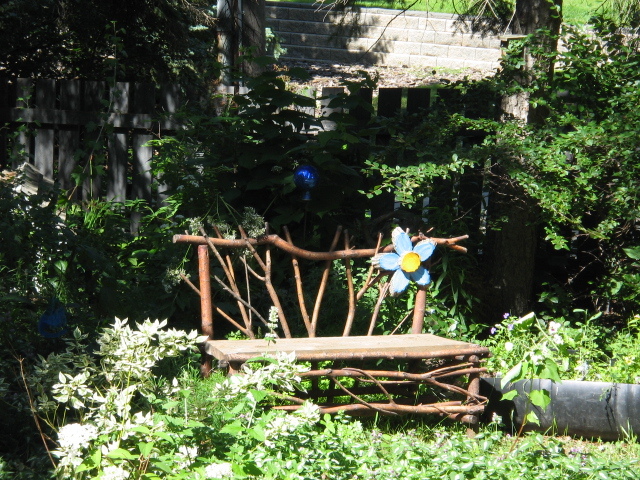 Ergo, making a clothespin bag could be seen as a garden project. 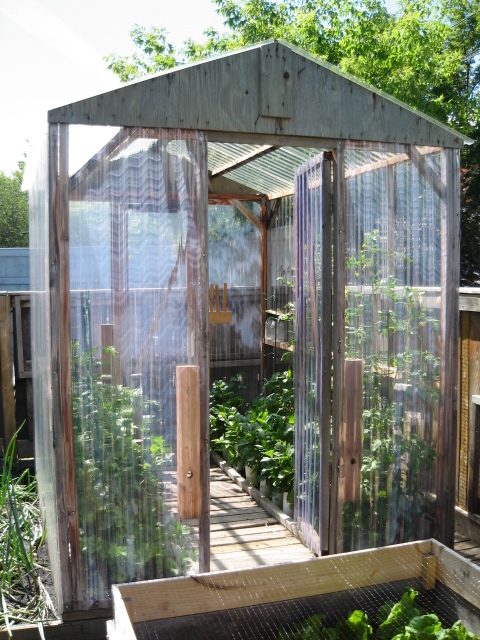 Besides, every self-respecting gardener loves the smell of sheets dried in the fresh spring air. 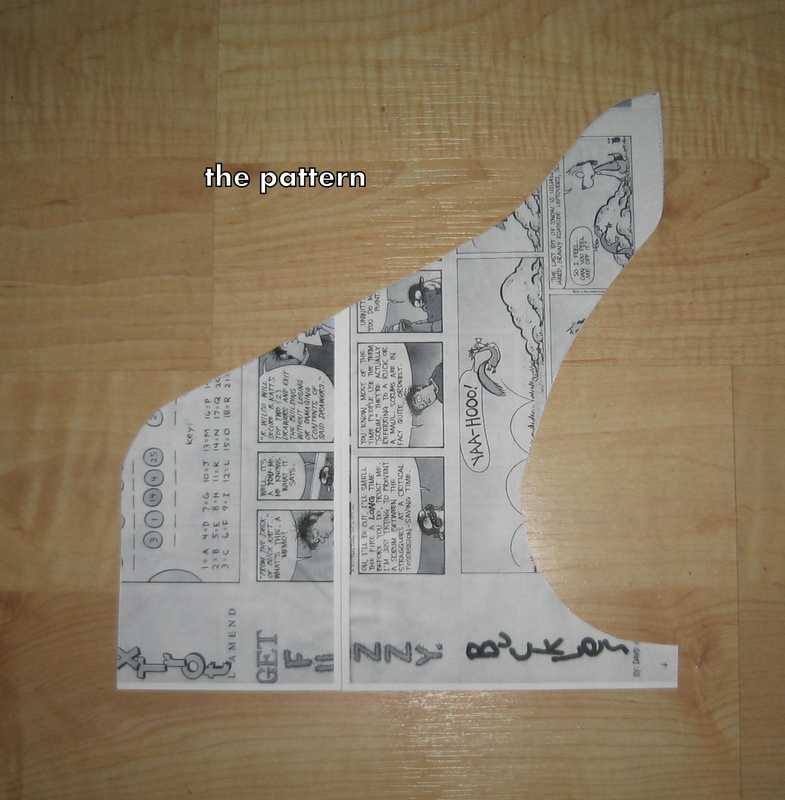 I have supplied a two part pattern which you need to print, cut out and paste together. Once you’ve done that, you should have a pattern that is 27 cm by 25 cm. 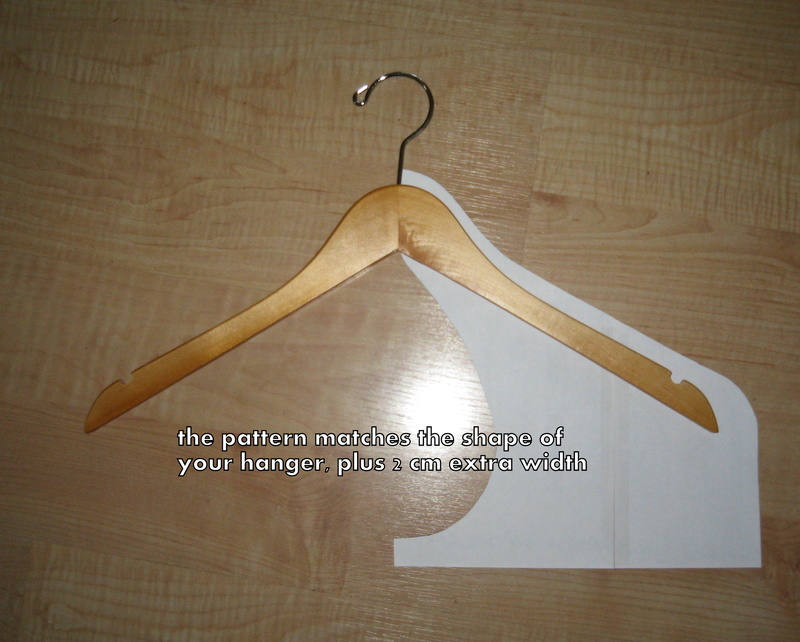 My pattern follows the shape of a specific clothes hanger – your shape my need alteration. 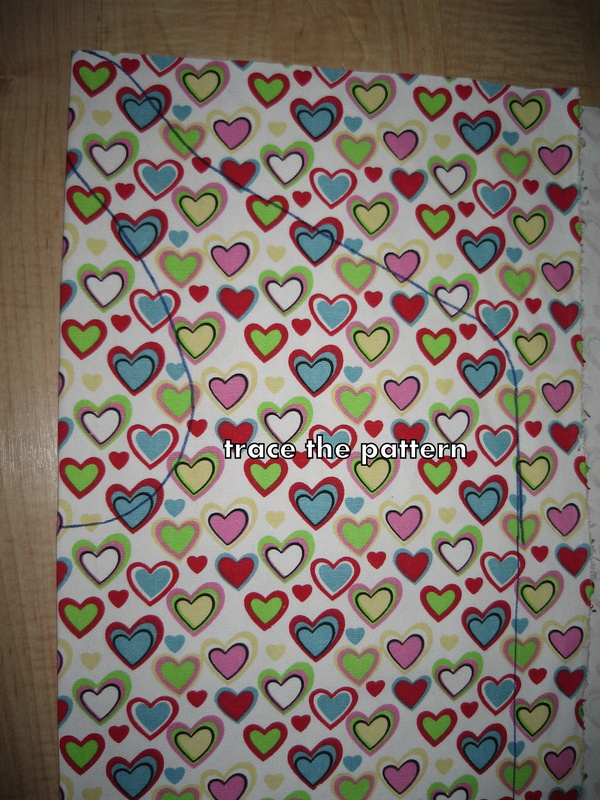 In addition, note that the pattern is 2 cm wider than the clothes hanger to allow for hems. Choose a funky fabric or something classic. 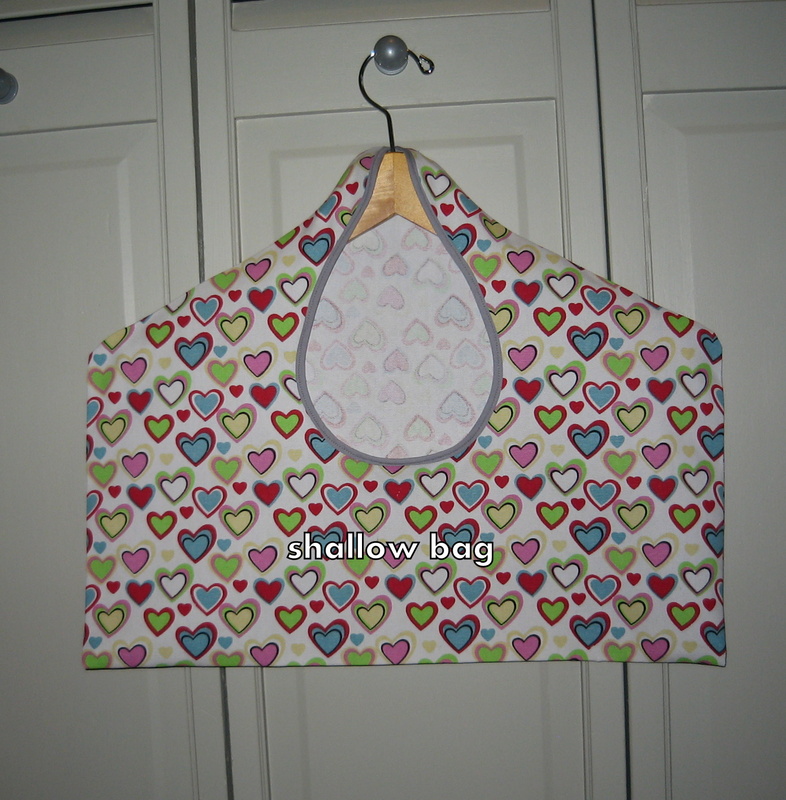 If you want the inside of the bag to be a different fabric than the outside, then pin two pieces of fabric together before cutting (making sure the wrong sides are together). 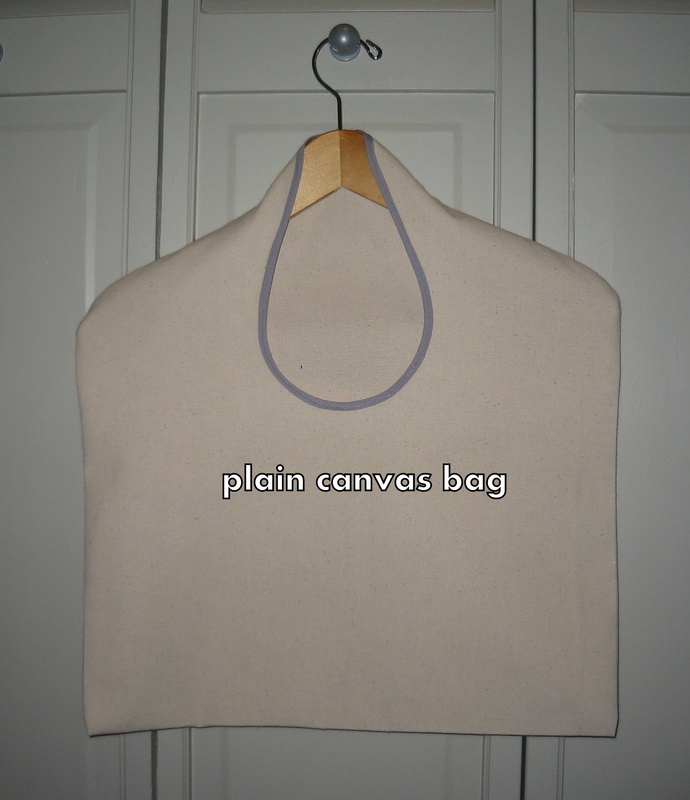 Fold the fabric over and place the pattern near the top. 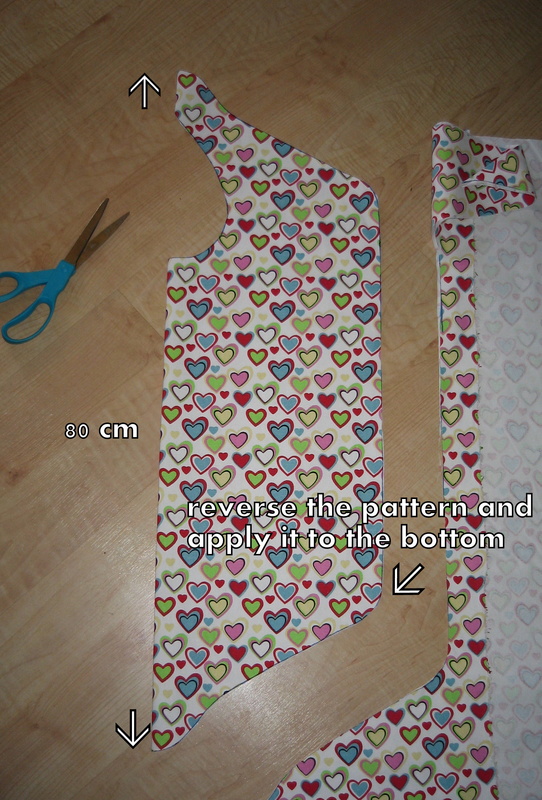 Trace the pattern onto the fabric, then measure 80 cm and place the pattern in reverse at the bottom of the fabric. 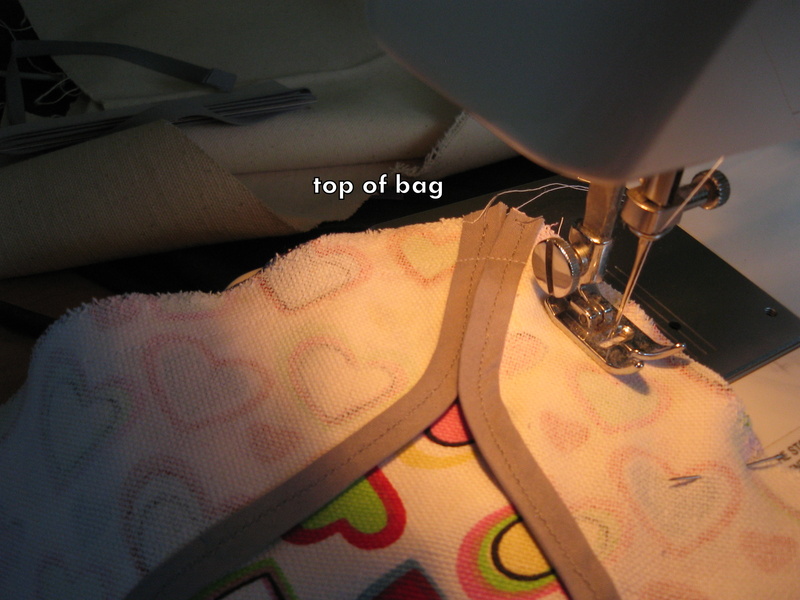 This length will determine the depth of your bag, so adjust it to your own needs. I have made some at 80 cm and some at as much as 110 cm. I use one bag for clothespins, one for an office organizer for my coat and personal items, and one at the back door for dog treats. 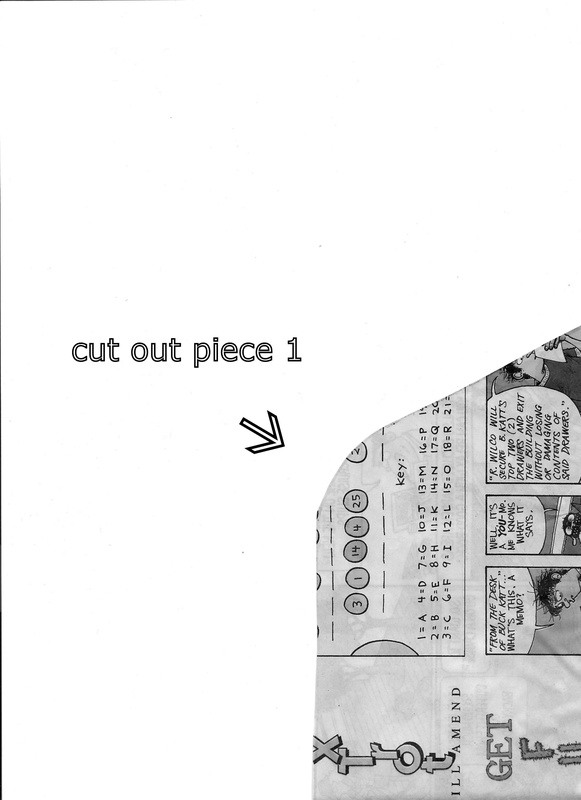 Cut out the pattern, and open up the center hole. 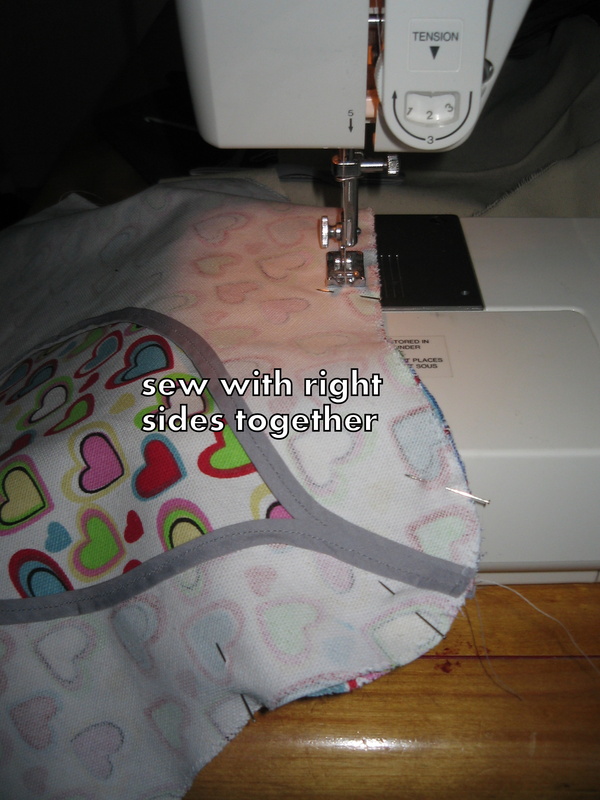 If you are working with two fabrics, pin them together and baste them near the edges with the right sides showing. 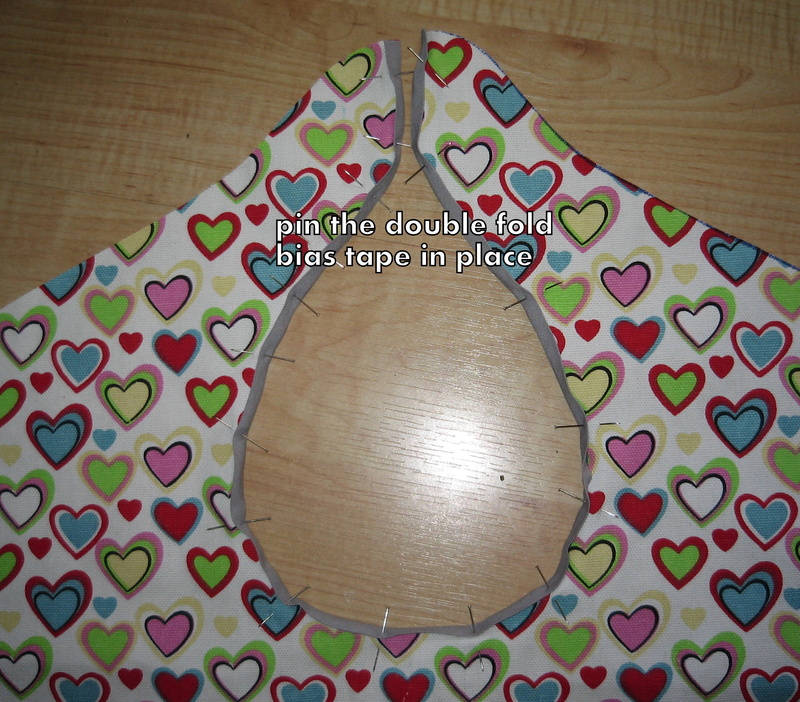 Carefully pin and sew double fold bias tape around the opening. 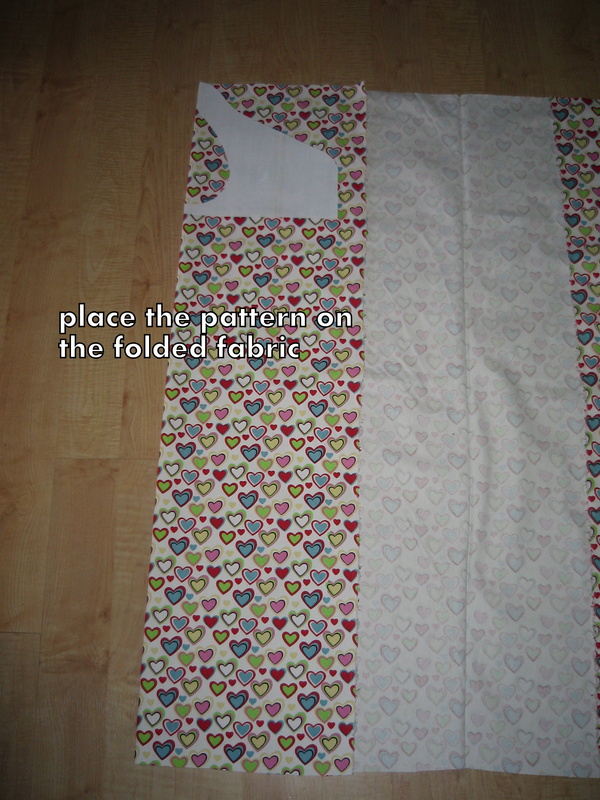 If your fabric is likely to fray, zigzag the remaining edges. 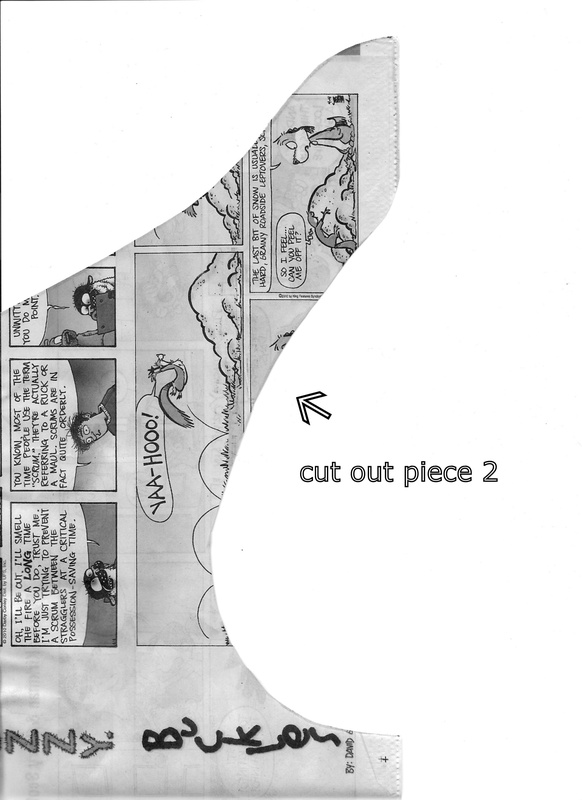 Fold the bottom to the top with right sides together and sew the exterior from the bottom corner to the top and back to the opposite bottom corner. Invert and press.